In 1928, the site's then-owner, Columbia University, leased the land to John D. Rockefeller Jr., who was the main person behind the complex's construction. Originally envisioned as the site for a new Metropolitan Opera building, the current Rockefeller Center came about after the Met could not afford to move to the proposed new building. Various plans were discussed before the current one was approved in 1932. Construction of Rockefeller Center started in 1931, and the first buildings opened in 1933. The core of the complex was completed by 1939. Rockefeller Center has two parts: the original center and the later International-style buildings. The original center has several sections: Radio City, for RCA's radio-related enterprises such as the Music Hall and 30 Rockefeller Plaza; the International Complex, for foreign tenants; and the remainder of the original complex, which originally hosted printed media as well as Eastern Air Lines. While 600 Fifth Avenue is located at the southeast corner of the complex and contains architecture similar to the original complex, it was built by private interests in the 1950s and was only acquired by the center in 1963. Described as one of the greatest projects of the Great Depression era, Rockefeller Center was declared a New York City landmark in 1985 and a National Historic Landmark in 1987. It is noted for the large quantities of art present in almost all of its Art Deco buildings, as well as its Radio City section and its ice-skating rink. The complex is also famous for its annual lighting of the Rockefeller Center Christmas Tree. For more details on construction, see Construction of Rockefeller Center. The first private owner of the site was physician David Hosack, who purchased twenty acres of rural land from New York City in 1801 for $5,000 and opened the country's first botanical garden, the Elgin Botanic Garden, on the site. The gardens operated until 1811, and by 1823, ended up in the ownership of Columbia University. Columbia moved its main campus north to Morningside Heights by the turn of the century. Rockefeller Center originated as a plan to replace the old Metropolitan Opera House (pictured). 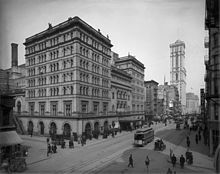 In 1926, the Metropolitan Opera started looking for locations to build a new opera house to replace the existing building at 39th Street and Broadway. By 1928, Benjamin Wistar Morris and designer Joseph Urban were hired to come up with blueprints for the house. However, the new building was too expensive for the Met to fund by itself, and John D. Rockefeller Jr. eventually gave his support to the project (John D. Rockefeller Sr., his father, was not involved). Rockefeller hired Todd, Robertson and Todd as design consultants to determine its viability. John R. Todd then put forth a plan for the Met. Columbia leased the plot to Rockefeller for 87 years at a cost of $3 million per year. The initial cost of acquiring the space, razing some of the existing buildings, and constructing new buildings was estimated at $250 million. The lease initially excluded a strip along Sixth Avenue on the west side of the plot, as well as another property on Fifth Avenue between 48th and 49th Streets. Rockefeller hosted a "symposium" of architectural firms to solicit plans for the complex, but it did not yield any meaningful plans. He ultimately hired Corbett, Harrison & MacMurray; Hood, Godley & Fouilhoux; and Reinhard & Hofmeister, to design the buildings. They worked under the umbrella of "Associated Architects" so none of the buildings could be attributed to any specific firm. The principal builder and "managing agent" for the massive project was John R. Todd, one of the co-founders of Todd, Robertson and Todd. The principal architect and leader of the Associated Architects was Raymond Hood, a student of the Art Deco architectural movement. The other architects included Harvey Wiley Corbett and Wallace Harrison. L. Andrew Reinhard and Henry Hofmeister had been hired by John Todd as the "rental architects", who designed the floor plans for the complex. The Metropolitan Square Corporation (the precursor to Rockefeller Center Inc.) was formed in December 1928 to oversee construction. However, the Metropolitan Opera wanted to hold out for a more favorable lease because it worried about the site's profitability. After the stock market crash of 1929, the Metropolitan Opera could not afford to move anymore, and on December 6, 1929, the plans for the new opera house were abandoned completely. In order to make a profit on the site as quickly as possible, Rockefeller devised new plans within a month so that the site could become profitable. The developers entered into talks with Radio Corporation of America (RCA) and its subsidiaries, National Broadcasting Company (NBC) and Radio-Keith-Orpheum (RKO), to build a mass media entertainment complex on the site. By May, RCA and its affiliates had made an agreement with Rockefeller Center managers to lease space and develop part of the complex. During early planning, the development was often referred to as "Radio City", "Rockefeller City", or "Metropolitan Square" (after the Metropolitan Square Corporation). Ivy Lee, the Rockefeller family's publicity adviser, suggested changing the name to "Rockefeller Center". John Rockefeller Jr. initially did not want the Rockefeller family name associated with the commercial project, but was persuaded on the grounds that the name would attract far more tenants. The name was formally changed in December 1931. Over time, the appellation of "Radio City" devolved from describing the entire complex to just the complex's western section, and by 1937, only the Radio City Music Hall contained the "Radio City" name. For the project, 228 buildings on the site were razed and some 4,000 tenants relocated. Demolition of the properties began in 1930. All of the buildings' leases had been bought by August 1931, though there were some tenants on the western and southeastern edges of the plot who refused to leave their property, and Rockefeller Center was built around these buildings. Excavation of the Sixth Avenue side of the complex began in July 1931, and construction on the first buildings—the Music Hall and Center Theatre—began in September and November, respectively. The plans for the complex notably included Indiana Limestone on the facades of the fourteen planned buildings, and the builders ordered 14,000,000 cubic feet (400,000 m3) of limestone in December 1931, the largest such order at the time. The RKO Building was the first structure to be completed, in September 1932, followed by the Music Hall in December 1932 and the British Empire Building in April 1933. The RCA Building's opening was delayed from May 1 to mid-May because of a controversy over Man at the Crossroads, a painting in the building's lobby, which was later covered up and removed. A new street through the complex, Rockefeller Plaza, was constructed in stages between 1933 and 1937. The complex's famed Christmas tree in the center of the plaza was erected for the first time in December 1933, and the complex's Prometheus statue was constructed in May 1934. By July 1934, the complex had leased 80% of the available space in the six buildings that were already opened. Work on two more internationally themed retail buildings and a larger, 38-story, 512-foot (156 m) "International Building", started in September 1934. One of the two small buildings was already rented to Italian interests. The final small building would have been rented by Germany, but Rockefeller ruled this out in 1934 after noticing National Socialist extremism from the country's government. The empty office site was downsized and became the "International Building North", rented by various international tenants. In April 1935, developers opened the International Building and its wings. The underground pedestrian mall and ramp system between 48th and 51st Streets was finished in early May. In 1936, an ice skating rink replaced the unprofitable retail space on the lower plaza, below ground level. The 36-story Time & Life Building,[c] named for anchor tenant Time Inc., was completed in November 1936, replacing an empty plot on the southern block that had been used for vehicle parking. Eleven buildings had been completed by 1937 at a total cost of over $100 million. A building for Associated Press on the northern block's empty lot, which had been reserved for the Metropolitan Opera house, was topped out by June 1938 and occupied by December of that year. The presence of Associated Press and Time Inc. expanded Rockefeller Center's scope from strictly a radio-communications complex to a hub of both radio and print media. The Guild, a newsreel theater, opened in 1938 along the curve of the truck ramp below the Associated Press Building. After Nelson Rockefeller became president of Rockefeller Center in 1938, he fired John Todd as the complex's manager and appointed Hugh Robertson in his place. The Rockefeller family started occupying the 56th floor of the RCA Building, though the offices would later expand to the 54th and 55th floors as well. A proposed 16-story building in the center of the southernmost block was offered to the Dutch government in 1938. The Dutch government did not enter the agreement because of World War II, though it did move into temporary offices in the International Building. Instead, Eastern Air Lines signed a lease for the 16-story building in June 1940. Excavation started in October 1938, and the building was topped out by April 1939. At the same time, Rockefeller Center Inc. wanted to develop the western half of the southern plot, which was partially occupied by the Center Theatre. The United States Rubber Company agreed to occupy the plot. and excavation of the U.S. Rubber Company Building site commenced in May 1939. John Rockefeller installed the building's ceremonial final rivet on November 1, 1939, marking the completion of the original complex. However, although the final rivet had been driven, the Eastern Air Lines Building was not completed until October 1940. The construction of the project employed between 40,000 and 60,000 people. The complex was the largest private building project ever undertaken in contemporary times. Architectural historian Carol Herselle Krinsky describes the center as "the only large private permanent construction project planned and executed between the start of the Depression and the end of the Second World War". According to writer Daniel Okrent, Rockefeller Center was so extensive that it was said that "you could do anything you wanted except sleep (no hotels), pray (no churches), or not pay rent to" John Rockefeller Jr. By fall 1939, the complex had 26,000 tenants and 125,000 daily visitors. That year, 1.3 million people went on a guided tour of Rockefeller Center or visited the RCA Building's observation deck, while 6 million people visited the underground shopping mall, and 7 million saw a performance at Rockefeller Center. Even before the U.S. officially entered World War II in 1941, Rockefeller Center was affected by the war. The Dutch government had been slated to take up one-fifth of the space at 10 Rockefeller Plaza, but could not do so because of World War II. Seven of the complex's eight travel agencies had to move elsewhere because of the war, and William Rhodes Davis, a tenant who shipped oil to Nazi Germany and fascist Italy, was denied a lease renewal in 1941. After the attack on Pearl Harbor on December 7, 1941, Rockefeller Center Inc. terminated all lease agreements with German, Italian, and Japanese tenants because their respective countries comprised the Axis powers, whom the United States were fighting against. Art on Palazzo d'Italia was taken down because they were seen as being fascist, and the Rainbow Room was closed to the public from 1943 to 1950. Instructions for blackouts and sandbags for extinguishing fires were placed throughout the complex. During the war, the RCA Building's Room 3603 became the primary location of the U.S. operations of British Intelligence's British Security Co-ordination, organized by William Stephenson. It also served as the office of Allen Dulles, who would later head the Central Intelligence Agency. Rockefeller Center only became profitable after the last building in the original complex was completed. The complex had incurred $26 million in debt by 1935, which had increased to $39 million by 1940. However, the complex was already 87% rented by 1940, and by the next year, Rockefeller Center was nearly fully rented, making a profit for the first time in its history. By 1944, the complex's existing rentable area totaled 5,290,000 square feet (491,000 m2), with 99.7% of the space being leased. Because the complex was almost completely rented, Rockefeller Center's managers kept waiting lists of potential tenants, and as a result of the waiting lists, the complex's office space became more desirable to these tenants. Two years later, there were 400 companies who wanted to rent space in Rockefeller Center, and the complex's managers determined that they would need to add 1,000,000 square feet (93,000 m2) of space in order to house all the prospective tenants. Rockefeller Center was also popular among visitors: for instance, the lines to enter one of the Music Hall's five daily shows stretched from Sixth Avenue and 50th Street to Fifth Avenue and 52nd Street, a distance of four blocks. In light of the abundance of possible renters, John Rockefeller Jr. transferred his ownership of the complex to his sons. The father collected the $57.5 million loan that Rockefeller Center Inc. owed him, then distributed it to his sons in the form of a tax break. Rockefeller Center eventually became the family's "single largest repository" of wealth. In 1950, Rockefeller Center Inc. paid the last installment of the $65 million mortgage owed to the Metropolitan Life Insurance Company. Three years later, the complex was making $5 million per year in profit, excluding the tax breaks. Rockefeller Center Inc. had started working on plans to expand the complex during World War II, even though the outbreak of the war had stopped almost all civilian construction projects. In 1943, the complex's managers bought land and buildings on three street corners near the complex. Rockefeller Center unveiled plans for expansion to the southwest and north in 1944. Esso (now Exxon) was one of the tenants who wanted to expand, and the company signaled that it would build its own office tower if Rockefeller Center's managers did not construct a building for them. They were given land at the north end of Rockefeller Plaza. In February 1947, the under-construction Esso Building, at the north end of the existing property, became part of Rockefeller Center after ownership of the building was transferred from the Haswin Corporation to Rockefeller Center, Inc. The building was topped out the next month. Hugh Robertson stepped down as manager the next year, and he was replaced by Gustav Eyssell. Some tenants, such as the Sinclair Oil Corporation, indicated that they wanted to leave the complex after their leases expired in 1962–1963 because the original complex's buildings did not have air conditioning, while newer office buildings did. As Columbia University still owned the land underneath the complex, they were tasked with installing air conditioning in the buildings. The new building would add emphasis to any north-south views of the center, since the existing complex's building only formed west-east axes. Another problem befell Rockefeller Center's key tenants, NBC and RCA, who were approached by other developers with the promise of more leasable space, a commodity that was scarce in the fully leased complex. These problems were pushed aside temporarily by the onset of the Korean War in 1950. By 1951, Columbia had acquiesced to reimbursing Rockefeller Center, Inc., for AC installation, while NBC and RCA were given permission to use the Center Theatre for extra broadcasting space. In 1949, in the face of a shrinking congregation, the St. Nicholas Church leased the church building to the Massachusetts Mutual Life Insurance Company, who then leased three contiguous plots from Rockefeller Center for a proposed 28-story building. The congregation was dispersed to other churches, and the old church building at Fifth Avenue and 48th Street was subsequently demolished. Construction commenced on 600 Fifth Avenue in 1950, and the tower was completed by 1952. The building was named after the Sinclair Oil Company, who leased eight floors. As a result of Sinclair's relocation to 600 Fifth Avenue, as well as Esso's relocation to 75 Rockefeller Plaza, NBC and RCA could expand into the space that Sinclair and Esso formerly occupied in the original complex, and they moved out of the Center Theatre shortly after the Sinclair Oil Company moved into its own tower. In summer 1953, Columbia bought all of the land along Sixth Avenue that had been owned by the Underel Corporation, at a cost of $5.5 million. Rockefeller Center leased the land back to Columbia until 1973 for $200,000 a year. This allowed Columbia to install air conditioning, passing the costs on to the remaining tenants in return for lease extensions. The small Center Theatre was deemed redundant to the Radio City Music Hall, and in its final years, had been used as an NBC and RCA broadcasting space. After NBC and RCA expanded into the floor area formerly occupied by Sinclair, the U.S. Rubber Company indicated that it wanted to expand its office building into the space that was taken up by the underused theater. In October 1953, it was announced that the theater would be demolished. It was demolished in 1954. Time-Life also wanted to expand, as its existing space in 1 Rockefeller Plaza was also becoming insufficient. In August 1953, Rockefeller Center, Inc., bought a tract of land on the west side of Sixth Avenue between 50th and 51st Streets. In 1956, two years after the demolition of the Center Theatre, officials announced the construction of a new tower, the Time-Life Building, on that plot. The 500-foot (150 m), $7 million building would include connections to the existing passageway system and to Roxy's Theater directly to its west. Time Inc. and Rockefeller Center formed a joint venture, Rock-Time Inc., which would share the tower's rent income between Time Inc. and Rockefeller Center. Construction on the Time-Life Building's steelwork started in April 1958, and the structure topped out in November of that year. The building officially opened in December 1959. Around 1960, Rockefeller Center, Uris Buildings Corporation, and Webb and Knapp formed another joint venture, Rock-Uris Corp. Originally, the venture wanted to construct a hotel to the west of 75 Rockefeller Center, but ultimately, a glass-and-concrete 43-story office building was built on the site. In 1961, the building was named after Sperry Corporation, who leased eight floors in the future building. The hotel, New York Hilton at Rockefeller Center, was built two blocks north in 1963. 600 Fifth Avenue was sold to Rockefeller Center's managers in 1963, thus officially becoming part of Rockefeller Center. The same year, officials from Esso (later renamed Exxon) proposed a new building for the complex because the company had outgrown the space in the buildings it already occupied. Rockefeller Center's managers hired the architectural firm Harrison & Abramovitz to design three new towers on the west side of Sixth Avenue, with one tower on each block between 47th and 50th Streets. The Exxon Building, at 1251 Avenue of the Americas between 49th and 50th Streets, was formally announced in August 1967. Three months later, officials also announced plans for a tower housing McGraw-Hill, located one block south at 1221 Avenue of the Americas. Plans for a tower anchored by Celanese, to be located at 1211 Avenue of the Americas between 47th and 48th Streets, would not be revealed until 1970. The Exxon Building opened in 1971, followed by the McGraw-Hill Building in 1973 and the Celanese Building in 1974. By the time all three of the new buildings were opened, Rockefeller Center contained 7% of Manhattan's 250,000,000 square feet (23,000,000 m2) of leasable office space. 600 Fifth Avenue and 75 Rockefeller Plaza received renovations in the early 1970s. Unlike in the rest of the complex, where different components were renovated one at a time to avoid disturbing tenants, the two structures were renovated all at once because their space was largely vacant. Rockefeller Center Inc. renewed their lease on the complex in 1973. Through the 1960s, the Music Hall was successful regardless of the status of the city's economic, business, or entertainment sectors as a whole. However, by the early 1970s, the proliferation of closed-captioned foreign movies had reduced attendance at the Music Hall. The first round of staff and performer firings began in 1972. By January 1978, the Music Hall was in debt, and the hall's annual attendance had declined to 1.5 million visitors, down from 5 million in 1968. Officials stated that it could not remain open after April. A grassroots campaign formed the Showpeople's Committee to Save Radio City Music Hall, and after several weeks of lobbying, the interior was made a city landmark in March, followed by a National Register of Historic Places listing in May. The hall was set to close on April 12, but five days before the planned closing date, the Empire State Development Corporation voted to create a nonprofit subsidiary to lease the Music Hall. A New York Times report in 1982 stated that Rockefeller Center had been popular among tenants from its inception, being almost fully rented for much of the first half-century of its existence. The major exception was in the 1970s, when it was only 85% rented. However, Rockefeller Center was not popular as an entertainment complex, having been used for mainly commercial purposes through its history. The New York City Landmarks Preservation Commission extended the Music Hall's landmark status to the exteriors of all of the original complex's buildings in 1985. In its approval of the complex's status, the commission wrote, "Rockefeller Center ranks among the grandest architectural projects ever undertaken in the United States". The buildings became a National Historic Landmark two years later. The United States Department of the Interior wrote in its report that the center was "one of the most successful urban planning projects in the history of American architecture". Columbia University was not making enough money from Rockefeller Center leases by the 1970s, since a series of negotiations with Rockefeller Center Inc. (now Rockefeller Group) had effectively reduced the annual lease payment to $11 million. The university's funds had dwindled so much that by 1972, their expenses were paid for by their endowment fund. In 1983, Columbia University started looking to sell the land beneath Rockefeller Center. Two years later, Columbia agreed to sell the land to the Rockefeller Group for $400 million. The Rockefeller Group immediately set out to modernize many aspects of the complex. The Rainbow Room was closed for a $20 million restoration and expansion that brought the restaurant's floor area to 4,500 square feet (420 m2), and it reopened in December 1987. The RCA Building's observation deck was subsequently closed because the Rainbow Room's expansion eliminated the only passageway to the observatory's elevator bank. In mid-1988, the RCA Building was renamed the GE Building. Mitsubishi Estate, a real estate company of the Mitsubishi Group, purchased the Rockefeller Group in 1989. Seven years later, in July 1996, the entire complex was purchased by a consortium of owners that included Goldman Sachs (which had 50 percent ownership), Gianni Agnelli, Stavros Niarchos, and David Rockefeller, who organized the consortium. Before the sale was even completed, the consortium sold 1,600,000 square feet (150,000 m2) of space in 30 Rockefeller Plaza to NBC, who had rented that space in the tower since the beginning. Tishman Speyer, led by Jerry Speyer, a close friend of David Rockefeller, and the Lester Crown family of Chicago, bought the original 14 buildings and land in 2000 for $1.85 billion. Owing to the decline of the newsreel theater industry, the Guild was shuttered in late 1999 after Tishman Speyer decided not to renew its lease. Tishman Speyer also decided to renovate the complex's retail spaces and underground concourse. The Rainbow Room closed in 2009 in preparation for an extensive renovation that started in 2011. The restaurant reopened in October 2014. The Rockefeller family moved out of their offices in the GE Building in 2014 due to rising rents. They re-settled in less expensive offices on 49th Street, near their old headquarters. The next year, in July 2015, the GE Building was renamed after Comcast, the parent company of NBCUniversal. The current complex is a combination of two building complexes and a standalone building: the original 14 Art Deco office buildings from the 1930s, one building across 51st Street built in 1947, and a set of four International-style towers built along the west side of Avenue of the Americas during the 1960s and 1970s. The center spans 22 acres (8.9 ha) in total, with some 17,000,000 square feet (1,600,000 m2) in office space. The landmarked buildings comprise 12 acres (49,000 m2) in Midtown, bounded by Fifth and Sixth Avenues between 48th and 51st Streets. Built as a cohesive unit, the buildings have been owned by Tishman Speyer since 2000. The buildings are spread along six blocks, with three blocks facing each avenue. These six blocks are the size of three standard blocks. One of the landmark buildings' defining features is the Indiana limestone facade possessed by all 14 structures, as specified in the original plans. :325 All of the structures were designed by Associated Architects, with Raymond Hood as the principal architect, and are listed on the National Register of Historic Places. For more details on the individual buildings, see Center Theatre (New York City), 30 Rockefeller Plaza, and Radio City Music Hall. The east side of Sixth Avenue, officially known as Avenue of the Americas, contains most of the buildings that were built specifically for the proposed radio complex. These buildings, which comprise "Radio City", are 1230 Avenue of the Americas, 30 Rockefeller Plaza, Radio City Music Hall and 1270 Avenue of the Americas. The idea for an integrated media complex somewhere came in 1920, when Owen D. Young, the chairman of RCA parent General Electric, suggested that RCA combine its then-disparate offices into one location. The western half of the southernmost block of the complex along Sixth Avenue, between 48th and 49th Streets, contains the former U.S. Rubber Company Building (now Simon & Schuster Building) at 1230 Avenue of the Americas. :326, 327 The last structure in the original complex to be built, it was topped out in November 1939. The 23-story building contains two 7-story wings on its north and south sides. It was renamed after Uniroyal in 1967, and again after Simon & Schuster in 1976. 1230 Avenue of the Americas was expanded to the east in 1954 after the Center Theatre adjacent to it was demolished. The 19-story annex, designed by Wallace Harrison and Max Abramovitz, had a glass facade on the lowest two stories—reflecting the design of the former American Airlines Building across Sixth Avenue—and a limestone facade above the second story. It is aligned with the axis of 10 Rockefeller Plaza on the eastern side of the block, and its northern and southern elevations contain five setbacks. The exterior also houses an abstract bas-relief created by Naum Gabo. The block immediately to the north, on Sixth Avenue between 49th and 50th Streets, is occupied by 30 Rockefeller Plaza and its western annex at 1250 Sixth Avenue. :326 The 70-floor, 872-foot-tall (266 m) building anchors the entire complex, and is located on the eastern side of the block. Opened in 1933 as the RCA Building, the building has been renamed multiple times, first to the GE Building in 1988, after General Electric bought RCA, and then to the Comcast Building in 2014 after Comcast's purchase of NBC. 30 Rockefeller Plaza was built as a single structure occupying the entire block between Sixth Avenue and Rockefeller Plaza, and its design was influenced by John Todd's desire for the building to use its air rights to their maximum potential. It has three main segments: the 66-story tower rising from the eastern part of the base with the famous Rainbow Room restaurant on the 65th floor,:325 and, formerly, the Rockefeller family office; a windowless segment in the middle of the base that houses NBC Studios; and a shorter 16-story tower on the western part of the base at 1250 Avenue of the Americas. As an icon of the complex, 30 Rockefeller Plaza's architecture influenced the design of the rest of the complex, with its limestone facade and Gothic-inspired four-leafed spandrels. Radio City Music Hall at 1260 Avenue of the Americas, occupying the southwestern portion of the block between 50th and 51st streets. :325, 326 The only remaining theater in the complex, it was similar in style to the Center Theatre, but at a larger scale. Construction started in December 1931, and the hall opened in December 1932. The 121-foot-high (37 m) Music Hall seats 6,000 people, and since opening has seen over 300 million visitors. Located in a niche adjacent to the neighboring 1270 Avenue of the Americas, the Music Hall is housed under the building's seventh-floor setback. The other building on the block between 50th and 51st Streets is 1270 Avenue of the Americas,:325, 326 a 31-story structure with a setback on the sixth floor. Originally the RKO Building, it was built over the Music Hall and shares many of the same exterior architectural details. Construction of the building started in 1931, and the building was complete by September 1932. Henry Hofmeister designed the building, as well as several other office buildings in the city that were built over theaters. The building's entrance design, blending in with that of the other buildings in the Radio City section, is marked by three sculptural bas-reliefs created by Robert Garrison for each of the building's three bays, signifying muses of Contemporary Thought, Morning, and Evening. In 1990, Robert Kushner created three bronze sculptures of winged spirits for the lobby. The RKO Building served as headquarters for its namesake company's movie production in the 1930s, and was renamed for the American Metal Climax Company (AMAX), its new owners, in the early 1960s. For details on the International Building, International Building North, and Palazzo d'Italia, see International Building (Rockefeller Center). For details on the other two buildings, see British Empire Building and La Maison Francaise (Rockefeller Center). The International Complex is located entirely along Fifth Avenue, with the tall International Building overshadowing four smaller country-themed buildings with retail outlets. :326 Three of the buildings—the tall tower and the two southern retail buildings—were planned after the cancellation of the incongruously designed oval retail building in 1931, while the two retail buildings to the north were added later. The low rectangular structures that replaced the oval building were seen as a more suitable design for the avenue. The current international theme was decided on due to a lack of American tenants willing to rent there; eventually, the buildings were occupied by British, French, and Italian interests, although the Italian interests ultimately were the only foreign tenants who rented for the long term. All four retail buildings have identical limestone facades, roof gardens, and ground-floor storefronts, but differ in the artworks with which they were decorated. Contemporary advertisements for shopping on Fifth Avenue touted the complex's proximity to Saks Fifth Avenue and St. Patrick's Cathedral. When viewed from Fifth Avenue, the buildings provide a foreground for the taller 30 Rockefeller Plaza building behind them. The Channel Gardens separate the British Empire Building and La Maison Francaise. The southernmost of the four retail buildings is La Maison Francaise (literally "the French House") at 610 Fifth Avenue,:326 which opened in October 1933. It is a six-story standalone building with a limestone facade with a sixth-story setback, as well as a partial ​1 1⁄2-story penthouse on the west half of the seventh story and a garden on the east side of the seventh-story roof. Immediately across the Channel Gardens to the north of La Maison Francaise is its twin, the British Empire Building at 620 Fifth Avenue,:326 which opened in April 1933. It is also a standalone building, with exactly the same massing as La Maison Francaise, down to the setback, rooftop garden, and half-penthouse. For details on the individual buildings, see 1 Rockefeller Plaza, 10 Rockefeller Plaza, and 50 Rockefeller Plaza. 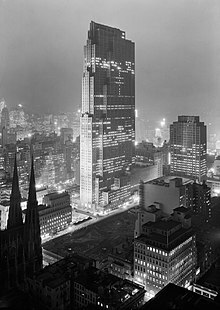 The 36-story tower at 1 Rockefeller Plaza, on the east side of the plaza between 48th and 49th Streets, is the original Time & Life Building that was opened in April 1937.:326 Time Inc. itself did not move into the building for another year after its completion. In 1960, the building was renamed for General Dynamics after Time Inc. had moved into 1271 Avenue of the Americas, the new Time-Life Building located three blocks away. The tower was renamed for its street address after General Dynamics moved to St. Louis in 1971. 600 Fifth Avenue is located at the corner of Fifth Avenue and 48th Street. :326, 327 The 28-story tower was once also known as the Sinclair Oil Building and the Manufacturers Hanover Trust Company Building. Its L-shaped footprint surrounds another building at the corner of 49th Street and Fifth Avenue, such that it fronts 200 feet (61 m) on 48th Street, 100 feet (30 m) on Fifth Avenue, but only 63 feet (19 m) midblock on 49th Street. Carson and Lundin designed 600 Fifth Avenue, along with 666 Fifth Avenue three blocks north, to complement the Rockefeller complex between the two towers. 600 Fifth Avenue contains a limestone facade, consistent with that of the original complex, as well as a seventh-story setback on its Fifth Avenue side and rooftop gardens on its setbacks. The building contains a main lobby at 48th Street, a service entrance to the same street, and a connection to 1 Rockefeller Plaza at its west end. 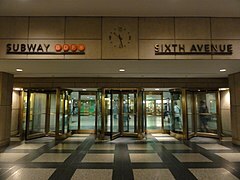 Unlike other buildings in the complex, 600 Fifth Avenue's ground level only contained one public entrance to maximize the ground-floor retail space, which was originally leased by Swiss interests and Pan Am Airlines. 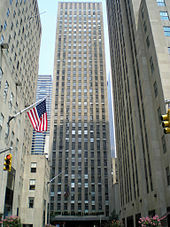 10 Rockefeller Plaza is located opposite 1 Rockefeller, on the west side of the plaza. :326 Its planning name was the Holland House, but the Dutch government did not sign on, so the building became the Eastern Air Lines Building instead. 10 Rockefeller was built as a 16-story slab, basically a miniature version of 1 Rockefeller. 10 Rockefeller's six-story parking garage was the first in Rockefeller Center. Notable modern tenants include the Today Show studios, and since 2005, the Nintendo New York store. 50 Rockefeller Plaza, formerly the Associated Press Building, is located on the west side of Rockefeller Plaza between 50th and 51st Streets. :326 It was constructed in the spring of 1938. The only building in the Center built to the outer limits of its lot line, the 15-story building took its shape from Associated Press's need for a single, undivided, loft-like newsroom as large as the lot could accommodate—namely, a 200-by-187-foot (61 by 57 m) blocky structure with no setbacks. The buildings subsequently added are separately owned by multiple owners. The first subsequent building to be built was 75 Rockefeller Plaza, at 51st Street on the north end of the complex, was built in 1947. The building contains a low base that is level with the rooftops of the low-rise buildings on 51st and 52nd Street, as well as a tall slab rising from the base, aligned in a north-south direction. It was originally built privately, but ownership was transferred to Rockefeller Center in February 1947. The 33-story, 400-foot (120 m) building was originally called the Esso Building. It was the headquarters of Standard Oil Company of New Jersey (later Exxon) until the early 1970s. The Esso Building was later renamed after Time Warner. It is now owned by Mohamed Al Fayed and managed by RXR Realty. 1211 Avenue of the Americas, the former Celanese Building, is located between 47th and 48th Streets. :326 The 592-foot-tall (180 m) tower opened in 1974. Now the News Corp Building, it is owned by an affiliate of Beacon Capital Partners, and leasing is managed by Cushman & Wakefield. 1221 Avenue of the Americas, the former McGraw-Hill Building, is located between 48th and 49th Streets. :326 The 674-foot-tall (205 m) building opened in 1973 and is owned by the Rockefeller Group. 1251 Avenue of the Americas, the former Exxon Building, is located between 49th and 50th Streets. :326 This 750-foot-tall (230 m) building was built from 1967 to 1971. Exxon's corporate headquarters moved into the structure in 1972, with co-ownership with Rockefeller Center's managers, and held an ownership stake there until 1986, when Mitsui & Company purchased the building. Exxon moved its headquarters to Texas in 1989, vacating all of the space in 1251 Avenue of the Americas. 1271 Avenue of the Americas, the former Time & Life Building, is located between 50th and 51st Streets. :326 The 587-foot-tall (179 m) building was completed in 1958 Construction on the Time-Life's Building's steelwork started in April 1958, and is owned by the Rockefeller Group. At the front of 30 Rock is the Lower Plaza, located in the very center of the complex and below ground level. The center plaza was part of the plans for the canceled Metropolitan Opera House. Although the opera house was canceled in 1929, the plaza was retained in subsequent plans. Originally, the plaza would have been located at ground level with a promenade called Channel Gardens, which led westward from Fifth Avenue to the plaza. In the March 1931 revision to the complex's blueprint, the center plaza was enhanced and sunken. The sunken plaza was originally supposed to be oval-shaped, but the plaza was later changed to a rectangular shape. The sunken rectangular plaza, planted with shrubs, provided a sense of privacy and enclosure when it was originally built. The plaza's main entrance is through the Channel Gardens, a 60-foot-wide (18 m), 200-foot-long (61 m) planted pedestrian esplanade running westward from Fifth Avenue between the British Empire Building and La Maison Francaise. The steeply sloping promenade was originally furnished with six narrow pools in the center of the space, each surrounded by hedges. The pools are topped with fountain heads designed by Rene Chambellan, each representing a different attribute: leadership, will, thought, imagination, energy, and alertness. Chambellan also designed the fountains' drain covers with various bronze depictions of sea creatures such as turtles and crabs. During the winter, the Channel Gardens' fountains were shut off and decorated with Valerie Clarebout's sculptures of angels. The twelve sculptures, each measuring 8 feet (2.4 m) tall, have been placed in the gardens every winter since 1954. At the western end of the promenade is a plaque commemorating the original Elgin Gardens, as well as a bronze monumental plaque to John D. Rockefeller Jr (see below). From there, a flight of the steps descends toward the rink, then splits into two different stairs heading both north and south. The western end of the plaza contains Paul Manship's 1933 masterwork, Prometheus (see also § Prometheus). The statue stands in a 60-by-16-foot (18.3 by 4.9 m) fountain basin in front of a grey rectangular wall. The Rockefeller Center Christmas Tree is placed above the statue from November to January every year; it is usually put in place and lit the week after Thanksgiving, and taken down the week after New Year's Day. The first tree was erected in 1934, and as successive trees received more lavish decorations, the tradition gradually became known worldwide. Much of the plaza's outdoor section is occupied by an ice rink. Installed in 1936, it replaced unprofitable retail space that had been constructed as part of the original center. Originally intended as a "temporary" measure, the rink became an immediate tourist attraction upon opening, becoming one of the world's most famous skating rinks in later years. In 1939, a permanent 120-by-60-foot (37 by 18 m) rink was installed, which necessitated the replacement of the center staircase from Channel Gardens. Its popularity inspired the construction of a skating rink in the former Center Theatre, and for a short time, there were also proposals to convert the lower plaza's ice rink to a roller skating rink during the springtime. The northern, southern, and eastern sides of the plaza are surrounded by a walkway that is several steps below street level, with staircases at either western end as well as at the plaza's Channel Gardens entrance. Some 200 flagpoles surround the plaza's perimeter at ground level, installed at regular intervals along the walkway and Rockefeller Plaza. The poles were installed in 1942 and were originally intended to be temporary. The flags later became permanent installations, fitting in with the nearby International Complex. The poles originally displayed the flags of the United Nations' member countries, although in later years they also carried flags of the U.S. states and territories, or decorative and seasonal motifs. Originally, there were 26 flags for each of the members of the United Nations, but as more countries became UN members, additional rows of poles were added on the north and south sides of the plaza. During national and state holidays, every pole carries the flag of the United States. The flags' ropes are secured with locks to prevent people from tampering with the flags. In July 1962, two years after John Rockefeller Jr.'s death, the center's management placed a plaque at the plaza, containing a list of ten principles in which he believed. The creed was first expressed in 1941. Rockefeller's beliefs include "the supreme worth of the individual and in his right to life, liberty, and the pursuit of happiness" (the first principle) and "truth and justice are fundamental to an enduring social order" (the sixth principle). The architect I. M. Pei has praised Rockefeller Center's lower plaza as being "perhaps the most successful open space in the United States, perhaps in the world", due to its success in drawing visitors. The plaza has also inspired similar developments around the world. Rockefeller Plaza is a pedestrian street running through the complex, parallel to Fifth and Sixth Avenues. This street was also part of the original plans for the Metropolitan Opera, and Benjamin Morris originally intended for the road to stretch from 42nd to 59th Streets. Only the 720-foot (220 m) section between 48th and 51st Streets was built, and the road was open in its entirety by 1937. The road was given the name "Rockefeller Plaza" in 1933, despite the potential confusion with the Lower Plaza, because it was believed that the "Plaza" in the road's name would emphasize its "spatial unity" with the Lower Plaza and Channel Gardens. The original intention of the street's construction was to enhance the shopping district of Fifth Avenue, to its east, but this never happened, and Rockefeller Plaza now primarily serves as a pedestrian passage that connects all of Rockefeller Center's separate components. As with most numbered crosstown streets in Manhattan, Rockefeller Plaza is 30 feet (9.1 m) wide with curbs on either side of an asphalt surface. However, the sidewalks are much wider than on typical streets. In addition, Rockefeller Plaza is supported by a multi-level steel skeleton underneath, which houses the underground mall, storage rooms, and the complex's shipping and loading center. As such, it contains a 14.5 inches (37 cm) layer of waterproofing. The surface of Rockefeller Plaza outside Radio City Music Hall, between 50th and 51st Street, contains small bronze circles for theatergoers to stand on while waiting to enter the hall. Until the 1980s, the plaza contained plaques that affirmed Columbia University's ownership of Rockefeller Center, but these were removed with the 1985 sale of the complex to the Rockefeller Group. Since Rockefeller Plaza is technically a purely private property to which the public is welcome, the plaza is closed for part of one day every year. The gardens atop Rockefeller Center's roofs were designed by Ralph Hancock and Raymond Hood. They came about because both Hood and Todd believed that rooftop gardens would enhance the complex's beauty; in particular, Hood compared the presence of rooftop gardens to the plants around a house. Originally, the gardens were supposed to be all interconnected via bridges between the roofs of each building. However, after Hood's death in 1935, the garden plan fell apart, as most of the complex's final buildings were built without provisions for gardens. The Associated Press Building's 15th-story roof, as well as the isolated location of the International Building and the high cost of these gardens, made this system infeasible. Ultimately, gardens were installed on 10 Rockefeller Plaza; 30 Rockefeller Plaza; the four International-themed retail buildings; the Center Theatre; and Radio City Music Hall. The gardens started running a $45,000-per-year deficit by 1937 due to various expenses as well as a lack of interest among tourists. The largest and most grand of the gardens was the 0.75-acre (0.30 ha) "Garden of the Nations" (alternatively "Gardens of the Nations"), which was installed on the eleventh-floor roof of 30 Rockefeller Plaza and opened in April 1935. The construction effort involved 3,000 short tons (2,700 long tons) of soil; 100 short tons (89 long tons) of rock from as far as England; 100,000 bricks; 2,000 trees and shrubs; 4,000 small plants; and 20,000 bulbs for flowers. They were originally composed of thirteen nation-specific gardens whose layouts were inspired by the gardens in the respective countries they represented. Each of the nation-themed gardens were separated by barriers. There was an "International Garden", a rock garden, in the center of the thirteen nation-themed gardens, which featured a meandering stream and 2,000 plant varieties. The Garden of the Nations also contained a children's garden, a modern-style garden, and a shrub-and-vegetable patch. Upon opening, the Garden of the Nations attracted many visitors because of its collection of exotic flora, and it became the most popular garden in Rockefeller Center. In its heyday, the Center charged admission fees for the Garden of the Nations. However, all of the nation-themed gardens were eventually removed, and the rock garden was left to dry up, supplanted by flower beds that were no longer open to the public. The International complex's gardens fared better. Hancock developed the British Empire Building and La Maison Francaise's gardens, while A.M. van den Hoek designed the gardens atop the other two buildings. The British and French gardens both contain a lawn and pool surrounded by hedges, while the other two gardens atop the International Building's wings include ivy lawns surrounded by hedges. The Italian garden also contained a cobblestone walkway and two plaques from the Roman Forum, while International Building North's garden has a paved walkway with steps. The roof gardens of the International Building's wings were restored in 1986 for $48,000 each, followed by the gardens on the British and French buildings, which were restored the next year. A series of shop- and restaurant-filled pedestrian passages stretch underground from 47th to 51st Streets between Fifth and Seventh Avenues. The pedestrian tunnel system was part of the updated 1931 plan for the center, and formal proposals for the system were submitted in 1933. It was supposed to comprise a system that stretched over 0.75 miles (1.21 km), all air-conditioned and lined with shops. Meanwhile, the pair of four-lane roadways was supposed to be located underneath the pedestrian mall, with delivery ramps leading to a 320-by-180-foot (98 by 55 m) central loading area 34 feet (10 m) below ground. Later plans also included a people mover. Ultimately, the people mover was not built, but the 25-space mall opened in May 1935. The complex's owner Tishman Speyer renovated the concourse in 1999 in an effort to make the underground retail space more noticeable and attract more upscale tenants. The original bronze ornaments and lighting were replaced, air-conditioning was installed, two passageways were demolished, and both ground-level and underground retail spaces were refurbished as part of the renovation. The concourse is the uppermost level of the complex's four basement levels, as well as the only basement level open to the public. The lower three levels are home to storage rooms and the complex's shipping center, the latter of which is accessed by a delivery ramp at 50th Street. Access is via lobby stairways in the six landmark buildings, through restaurants surrounding the concourse-level skating rink, and via elevators to the north and south of the rink. There is also a connection to the New York City Subway's 47th–50th Streets–Rockefeller Center station, serving the B, ​D, ​F, and ​M trains. As of 2018[update], the largest retailer in the concourse is Banana Republic. Two small buildings abut the north and south corners of the 30 Rockefeller Plaza annex. These buildings exist as a result of two tenants who refused to sell their rights to Rockefeller during construction. The grocer John F. Maxwell would only sell his property at Sixth Avenue and 50th Street if he received $1 million in return. However, Rockefeller's assistant Charles O. Heydt mistakenly said that Maxwell would never sell, and Maxwell himself said that he had never been approached by the Rockefellers. Consequently, Rockefeller Center did not purchase Maxwell's property until 1970. Maxwell's demand paled to that of Daniel Hurley and Patrick Daly, owners of a speakeasy who, since 1892, had leased a property at 49th Street. They would sell for $250 million, roughly the cost of the entire complex. They initially gained a lease extension until 1942, but ended up leasing their property until 1975, and was built around Maxwell's and Hurley and Daly's properties. On the southeast corner of the complex, on Fifth Avenue between 48th and 49th Streets, there were also two pre-existing buildings. Robert Goelet owned a lot at 2–6 West 49th Street and wished to develop it. The St. Nicholas Church, located on 48th Street behind Goelet's land, also refused to sell the property despite an offer of up to $7 million for the property. The church was razed in 1949 to make way for 600 Fifth Avenue. In November 1931, John Todd suggested the creation of a program for placing distinctive artworks within each of the buildings. Hartley Burr Alexander, a noted mythology and symbology professor, was tasked with planning the complex's arts installations. Alexander submitted his plan for the site's artwork in December 1932. As part of the proposal, the complex would have a variety of sculptures, statues, murals, friezes, decorative fountains, and mosaics. In an expansion of Hood's setback-garden plan, Alexander's proposal also included rooftop gardens atop all the buildings, which would create a "Babylonian garden" when viewed from above. At first, Alexander suggested "Homo Fabor, Man the Builder" as the complex's overarching theme, representing satisfaction with one's occupation rather than with the wage. However, that theme was not particularly well received by the architects, so Alexander proposed another theme, the "New Frontiers"; this theme dealt with social and scientific innovations and represented the challenges that humanity faced "after the conquest of the physical world". In theory, this was considered a fitting theme, but Alexander had been so specific about the details of the necessary artworks that it limited the creative license for any artists who would be commissioned for such works, so he was fired. It took several tries to agree on the current theme, "The March of Civilization", at which point some of the art had already been commissioned, including those which Alexander had proposed. The art that currently exists within Rockefeller Center was inspired by Professor Alexander's arts program. Sculptor Lee Lawrie contributed the largest number of individual pieces – twelve, including the Atlas statue facing Fifth Avenue and the conspicuous friezes of Wisdom above the main entrance to 30 Rockefeller Plaza. Edward Trumbull coordinated the colors of the works located inside the buildings, and Léon-Victor Solon did the same job for the exterior pieces. 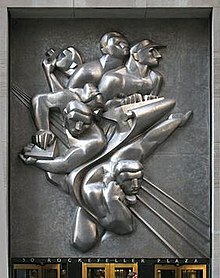 Isamu Noguchi's gleaming stainless steel bas-relief, News, over the main entrance to 50 Rockefeller Plaza (the Associated Press Building) was, at the time of commissioning, the largest metal bas-relief in the world. The complex's other sculptors included Rene Chambellan, Leo Friedlander, Robert Garrison, Alfred Janniot, Carl Paul Jennewein, Gaston Lachaise, Leo Lentelli, Paul Manship, Giacomo Manzù, Hildreth Meiere, and Attilio Piccirilli. Other artists included Carl Milles, Margaret Bourke-White, and Dean Cornwell. One of the center's more controversial works was Man at the Crossroads, created by Diego Rivera, which was originally commissioned for 30 Rockefeller Plaza's lobby but was demolished before it could be completed. Commissioned in 1936 and executed by Lee Lawrie and Rene Chambellan, the Atlas statue is located in the International Building's courtyard. It faces eastward toward St. Patrick's Cathedral on Fifth Avenue. The statue depicts Atlas the titan, with exaggerated muscles, supporting the celestial vault on his shoulders. Paul Manship's highly recognizable bronze gilded Prometheus statue, commissioned in 1934, is located at the western end of the sunken plaza. It stands 18 feet (5.5 m) high and weighs 8 short tons (7.1 long tons). The statue depicts the Greek legend of the Titan Prometheus recumbent, bringing fire to mankind. The statue is flanked by two smaller gilded representations of Youth and Maiden, which were relocated to Palazzo d'Italia from 1939 to 1984 because Manship thought the representations did not fit visually. The model for Prometheus was Leonardo (Leon) Nole, and the inscription, a paraphrase from Aeschylus, on the granite wall behind, reads: "Prometheus, teacher in every art, brought the fire that hath proved to mortals a means to mighty ends." In 1932, the Mexican socialist artist Diego Rivera (whose sponsor was the Museum of Modern Art and whose patron at the time was Abby Aldrich Rockefeller, the wife of John D. Rockefeller, Jr.), was commissioned by their son Nelson to create a color fresco for the 1,071-square-foot (99 m2) wall in the lobby of the then-RCA Building. This came after Nelson had been unable to secure the commissioning of either Matisse or Picasso. Previously Rivera had painted a controversial fresco in Detroit titled Detroit Industry, commissioned by Abby and John's friend, Edsel Ford, who later became a trustee of the Museum of Modern Art. As expected, his Man at the Crossroads became controversial, as it contained Moscow May Day scenes and a clear portrait of Lenin, which had not been apparent in initial sketches. After Nelson issued a written warning to Rivera to replace the offending figure with an anonymous face, Rivera refused (after offering to counterbalance Lenin with a portrait of Lincoln). As per Nelson's orders, Rivera was paid for his commission and the mural was papered over. Nine months later, after all attempts to save the fresco were explored—including relocating it to Abby's Museum of Modern Art—it was destroyed as a last option. (Rivera would later partially recreate the work as Man, Controller of the Universe, using photographs taken by an assistant, Lucienne Bloch.) Rivera's fresco in the Center was replaced with a larger mural by the Catalan artist Josep Maria Sert, titled American Progress, depicting a vast allegorical scene of men constructing modern America. Containing figures of Abraham Lincoln, Mahatma Gandhi, and Ralph Waldo Emerson, it wraps around the west wall of 30 Rockefeller Plaza's Grand Lobby. In its earliest years, Rockefeller Center received largely negative and pessimistic reviews from architectural critics. The most cynical opinion came from renowned architectural scholar Lewis Mumford, who so hated the "weakly conceived, reckless, romantic chaos" of the March 1931 plans for Rockefeller Center that he reportedly went into exile in upstate New York. He blamed John Rockefeller Jr. for the complex's "inability to consider a new type of problem in any form except the skyscraper stereotype". Mumford's view of the complex was only marginally less negative when he revisited the issue in December 1933: he said that it could be "large, exciting, [and] romantic" at night, but that "a mountain or ash heap of the same size would do the trick almost as well, if the lights were cleverly arranged". Ralph Adams Cram, who adhered to a more classical architectural style, also had a pessimistic view of the plans unveiled in March 1931. He called the plan for Rockefeller Center "an apotheosis of megalomania, a defiant egotism" arising from an ostentatious display of wealth, and said that "the sooner we accomplish the destiny it so perfectly foreshadows, the sooner we shall be able to clear the ground and begin again". Douglas Haskell, who formerly edited Architectural Forum magazine, wrote that Rockefeller Center's ambiance was "gray, unreal, baleful". The urban planner Le Corbusier had a more optimistic view of the complex, expressing that Rockefeller Center was "rational, logically conceived, biologically normal, [and] harmonious". He wrote that although Rockefeller Center would inevitably be disorganized in its earliest years, it would eventually adhere to a certain "order", and he also praised the complex for being a paragon of "noble" and "efficient" construction. The writer Frederick Lewis Allen took a more moderate viewpoint, saying that negative critics had "hoped for too much" precisely because Rockefeller Center had been planned during an economically prosperous time, but was constructed during the Depression. Even though Allen thought that the art was mediocre and the opportunities for a less lively complex were wasted, he stated that Rockefeller Center had an aura of "festivity" around it, unlike most other office buildings in America. Sigfried Giedion wrote in his book Space, Time and Architecture that Rockefeller Center's design was akin to a "civic center" whose design represented the 1930s version of the future. Henry Luce, the founder of Time Inc., said in 1941 that Rockefeller Center represented "the true world of tomorrow", as opposed to the 1939 New York World's Fair, whose "World of Tomorrow" representations "are today junk piles under the winter snow". Novelist Gertrude Stein said in 1935, "The view of Rockefeller Center from Fifth Avenue is the most beautiful thing I have ever seen." By the 1940s, most critics had positive views of Rockefeller Center. Even Mumford praised the complex, lamenting in 1947 that the new headquarters of the United Nations on First Avenue had no "human scale" or "transition from the intimate to the monumental", whereas Rockefeller Center's buildings "produce an aesthetic effect out of all proportion to their size". Haskell wrote in 1966 that Rockefeller Center's designers "seemed to have regarded urban life as an enhanceable romance". In 1969, the art historian Vincent Scully wrote, "Rockefeller Center is one of the few surviving public spaces that look as if they were designed and used by people who knew what stable wealth was and were not ashamed to enjoy it." The New York State Office of Parks, Recreation and Historic Preservation commissioned a report in 1974 entitled "Grand Central Terminal and Rockefeller Center: A Historic-Critical Estimate of Their Significance", in which they concluded that Rockefeller Center, along with Central Park and Grand Central Terminal, were the only three developments that could slow down Manhattan's "remorseless process of expansion and decay". In 1976, New York Times architectural critic Paul Goldberger wrote, "What makes Rockefeller Center work is that it is at once a formal Beaux‐Arts‐influenced complex of dignified towers and a lively, utterly contemporary amalgam of shops, plazas and street life. It is as natural a home for a 1970's street festival as for a 1930's movie about cafe society: few designs can join such disparate worlds so comfortably." ^ The actual architects are "Associated Architects", a consortium composed of Corbett, Harrison & MacMurray; Hood, Godley & Fouilhoux; and Reinhard & Hofmeister. Hood was considered the main architect, and is noted as such on the NRHP nomination. ^ The "Time-Life Building" appellation would later apply to 1271 Avenue of the Americas, also located in the Rockefeller Center, which opened in 1959. Afterward, the original Time & Life Building became known as 1 Rockefeller Plaza. ^ a b c d Federal Writers' Project 1939, p. 334. ^ a b c d e Adams 1985, p. 13. ^ a b c d e f Jackson 2010, p. 1115. ^ a b c d e f g h i j k l Fitch & Waite 1974, p. 12. ^ a b c d Krinsky 1978, p. 44. ^ a b c d e "Rockefeller Center". National Historic Landmark summary listing. National Park Service. September 18, 2007. ^ Dana Schulz (March 30, 2016). "The Country's First Botanic Garden Was on 20 Wooded Acres at Today's Rockefeller Center". 6sqft. Retrieved September 1, 2016. ^ a b "Rockefeller Buys $100,000,000 Realty; Part For New Opera" (PDF). The New York Times. December 28, 1928. ISSN 0362-4331. Retrieved November 10, 2017. ^ Fitch & Waite 1974, p. 8. ^ Adams 1985, p. 12. ^ a b Fitch & Waite 1974, p. 9. ^ Okrent 2003, p. 8. ^ Okrent 2003, pp. 11–12. ^ a b Glancy 1992, p. 427. ^ a b Radio City Music Hall Landmark Designation 1978, p. 3. ^ a b Okrent 2003, p. 21. ^ Fitch & Waite 1974, p. 10. ^ Krinsky 1978, pp. 31–32. ^ Krinsky 1978, p. 33. ^ a b c d "Rockefeller Site For Opera Dropped" (PDF). The New York Times. December 6, 1929. ISSN 0362-4331. Retrieved November 10, 2017. ^ Krinsky 1978, p. 33, map p. 34. ^ Seielstad 1930, p. 19. ^ "Engineers Engaged For Opera Centre" (PDF). The New York Times. October 5, 1929. ISSN 0362-4331. Retrieved November 10, 2017. ^ Radio City Music Hall Landmark Designation 1978, p. 6. ^ Krinsky 1978, p. 36. ^ Balfour 1978, p. 16. ^ a b c d e f Fitch & Waite 1974, p. 11. ^ Okrent 2003, pp. 102–103. ^ Krinsky 1978, p. 32. ^ Goldberger, Paul (December 3, 1981). "Wallace Harrison Dead At 86; Rockefeller Center Architect". The New York Times. Retrieved November 16, 2017. ^ Okrent 2003, p. 58. ^ Balfour 1978, p. 9. ^ Krinsky 1978, pp. 48–49. ^ Balfour 1978, p. 11. ^ Krinsky 1978, p. 48. ^ Krinsky 1978, p. 50. ^ Adams 1985, p. 29. ^ Okrent 2003, p. 70. ^ a b Balfour 1978, p. 53. ^ Okrent 2003, p. 142. ^ Krinsky 1978, pp. 50, 52, map p. 51. ^ Balfour 1978, p. 17. ^ "New Theatre Seeks Rockefeller Site; Great Playhouse To Exploit Television, Music, Talkies, Radio And Plays Planned. Roxy Reported As Head National Broadcasting Co., General Electric And R-K-O Said To Be Linked In Midtown Project" (PDF). The New York Times. February 15, 1930. ISSN 0362-4331. Retrieved November 10, 2017. ^ Krinsky 1978, pp. 53–55, map p. 54. ^ Adams 1985, p. 45. ^ "Rockefeller Plans Huge Culture Centre; 4 Theatres in $350,000,000 5th Av. Project; A huge theatrical venture which will exploit television, music radio, talking pictures and plays will be erected, it was disclosed last night, on the site assembled by John D. Rockefeller Jr. between Fifth and" (PDF). The New York Times. June 14, 1930. Retrieved November 15, 2017. ^ "Rockefeller Begins Work in the fall on 5th Av. Radio City" (PDF). The New York Times. June 17, 1930. ISSN 0362-4331. Retrieved November 10, 2017. ^ a b Krinsky 1978, p. 57. ^ Popular Mechanics 1932, pp. 252–253. ^ "Radio City to Create a New Architecture; Model and Ground Plan of the Radio City" (PDF). The New York Times. March 6, 1931. ISSN 0362-4331. Retrieved November 11, 2017. ^ "Many Realty Interests Seen In Metropolitan Area; Radio City Centre Scene of Activity" (PDF). The New York Times. October 4, 1931. ISSN 0362-4331. Retrieved November 11, 2017. ^ Krinsky 1978, pp. 57–58. ^ a b Okrent 2003, pp. 180–182. ^ Balfour 1978, p. 36. ^ a b Adams 1985, p. 92. ^ Balfour 1978, p. 44. ^ a b Krinsky 1978, p. 59. ^ a b "Plans Revised For Radio City" (PDF). The New York Sun. August 24, 1931. p. 20. Retrieved November 16, 2017 – via Fultonhistory.com. ^ a b c Hood, Raymond (August 23, 1931). "The Babylonian Dream Soon to Be Made Reality in Radio City Is Seen by the Architects as a Huge Experiment Holding the Possibility of a Completely Transformed Metropolis" (PDF). The New York Times. ISSN 0362-4331. Retrieved November 11, 2017. ^ Krinsky 1978, pp. 61–62. ^ a b "Rockefeller Centre To Have Roof Bridges" (PDF). The New York Times. March 19, 1932. ISSN 0362-4331. Retrieved November 11, 2017. ^ a b Adams 1985, p. 87. ^ a b International Building Landmark Designation 1985, p. 8. ^ a b c Krinsky 1978, p. 69. ^ Krinsky 1978, pp. 16–17. ^ a b "Radio City to Bear the Name of Rockefeller; Formal Title Will Be Chosen in a Few Days" (PDF). The New York Times. December 21, 1931. ISSN 0362-4331. Retrieved November 11, 2017. ^ Okrent 2003, p. 258. ^ a b c Miller, Moscrip (1937). "Mystery on Sixth Ave" (PDF). Screen & Radio Weekly. Retrieved November 10, 2017 – via Fultonhistory.com. ^ Okrent 2003, p. 53. ^ Glancy 1992, p. 428. ^ "Radio City Hold-Out Won By Two Icemen; Pop Was Only Runner-Up In Old Tenants' Endurance Test, Final Count Reveals. Abdication Is Complete Rockefeller Interests Settle With Cellar Merchants And Wreckers Move On Last Stronghold" (PDF). The New York Times. August 21, 1931. ISSN 0362-4331. Retrieved November 11, 2017. ^ a b Alpern & Durst 1996, pp. 38, 40. ^ a b c Okrent 2003, pp. 93–94, map p. 92. ^ a b "'Radio City' Digging To Begin Tomorrow" (PDF). The New York Times. July 26, 1931. ISSN 0362-4331. Retrieved November 11, 2017. ^ Radio City Music Hall Landmark Designation 1978, p. 4. ^ Gilligan, Edmund (November 29, 1932). "Roxy Presents New Mood" (PDF). The New York Sun. p. 20. Retrieved November 11, 2017 – via Fultonhistory.com. ^ a b "Radio City Towers To Be Of Limestone" (PDF). The New York Times. December 24, 1931. ISSN 0362-4331. Retrieved November 11, 2017. ^ a b "Nelson Rockefeller To Address Skyscraper Workers Tomorrow" (PDF). Tarrytown Daily News. September 19, 1932. p. 16. Retrieved November 10, 2017 – via Fultonhistory.com. ^ a b c "Mount Vernon Shares Glory At Opening Of Radio City Music Hall In New York" (PDF). Daily Argus. Mount Vernon, New York. December 28, 1932. p. 16. Retrieved November 10, 2017 – via Fultonhistory.com. ^ a b "Music Hall Marks New Era In Design; Many Traditions In Building Of Theatres Cast Aside For Modern Devices. Color Lighting Featured Effects Of Decorative Scheme Are Dependent On An Elaborate System Of Illumination" (PDF). The New York Times. December 28, 1932. ISSN 0362-4331. Retrieved November 12, 2017. ^ a b Adams 1985, p. 93. ^ Balfour 1978, p. 185. ^ a b c "' Rockefeller Plaza' Joins City Directory; Center's New Street and Promenade Named" (PDF). The New York Times. January 16, 1933. ISSN 0362-4331. Retrieved November 11, 2017. ^ a b "Rockefeller Unit Ready For Opening" (PDF). The New York Times. March 31, 1937. Retrieved November 27, 2017. ^ a b "Rockefeller Center Gets A 70-Foot Tree; Holiday Musical Programs To Be Presented At Huge Spruce Set Up In Plaza" (PDF). The New York Times. December 19, 1934. ISSN 0362-4331. Retrieved November 11, 2017. ^ a b c "Statue in Center Plaza; Giant Figure of Prometheus Set at Rockefeller Fountain" (PDF). The New York Times. January 10, 1934. ISSN 0362-4331. Retrieved November 11, 2017. ^ Krinsky 1978, p. 88. ^ "Tenants Flock To 5th Av. Centre; Six Rockefeller Buildings In Big Development 80 Per Cent Rented. Forecast Is Exceeded Result Is Held to Show That Business Situation Is Fundamentally Sound" (PDF). The New York Times. July 27, 1934. ISSN 0362-4331. Retrieved November 11, 2017. ^ "Rockefeller Units To Cost $8,000,000; Plans Filed For Buildings On Fifth Avenue Between 50th And 51st Sts. One Is 38-Story Edifice Foreign Groups Due To Occupy Twin Seven-Story Structures On Avenue Frontage" (PDF). The New York Times. May 9, 1934. ISSN 0362-4331. Retrieved November 21, 2017. ^ Balfour 1978, p. 205. ^ Okrent 2003, pp. 283–284. ^ Adams 1985, p. 129. ^ Okrent 2003, p. 285. ^ a b "New Skyscraper Record; Rockefeller Center Units Notable for Construction Speed" (PDF). The New York Times. June 26, 1935. ISSN 0362-4331. Retrieved November 11, 2017. ^ "463 Leases in Center" (PDF). New York Sun. June 1, 1935. p. 43. Retrieved November 11, 2017 – via Fultonhistory.com. ^ a b "Rockefeller City Finishes Tunnels" (PDF). The New York Times. May 4, 1935. ISSN 0362-4331. Retrieved November 11, 2017. ^ a b Krinsky 1978, pp. 92–93. ^ Okrent 2003, pp. 358–359. ^ a b WGBH American Experience . The Rockefellers. American Experience. Retrieved December 19, 2016. ^ a b "Skating Pond to Open On Rockefeller Plaza" (PDF). The New York Times. December 10, 1936. Retrieved November 14, 2017. ^ a b Adams 1985, p. 197. ^ a b c Krinsky 1978, p. 112. ^ a b "Time's Tenants Begin Moving In; Finishing Touches Are Put on 48-Story Structure, Rising 587 Feet". The New York Times. December 22, 1959. Retrieved December 4, 2017. ^ a b "Business Moving Marked By Speed" (PDF). The New York Times. May 2, 1938. ISSN 0362-4331. Retrieved November 7, 2017. ^ "Steel Work Finished On Rockefeller Unit; Frame for 36-Story Building Is Completed in 43 Days, a Record for Speed" (PDF). The New York Times. November 28, 1936. Retrieved November 14, 2017. ^ a b c d Adams 1985, p. 219. ^ Okrent 2003, p. 338. ^ "Rockefeller Will Finish Center At Once to Provide New Jobs" (PDF). The New York Times. 1938. ISSN 0362-4331. Retrieved November 14, 2017. ^ a b c Krinsky 1978, p. 94. ^ "Rockefeller Center Abandons Opera Plans; To Build on Site Long Held for Metropolitan" (PDF). The New York Times. May 11, 1937. Retrieved November 21, 2017. ^ a b "Steel Work Finished; New 15-Story Unit in Rockefeller Center 'Topped Out'" (PDF). The New York Times. June 17, 1938. Retrieved November 20, 2017. ^ "Associated Press Occupies New Home" (PDF). The New York Times. December 19, 1938. Retrieved November 22, 2017. ^ a b Adams 1985, p. 210. ^ "Film House Opens Today; Fourth Unit in Newsreel Chain Is in Rockefeller Center" (PDF). The New York Times. December 2, 1938. Retrieved November 22, 2017. ^ a b Balfour 1978, p. 56. ^ Okrent 2003, p. 384. ^ a b c d Roberts, Sam (November 24, 2014). "Why Are Rockefellers Moving From 30 Rock? 'We Got a Deal'". The New York Times. Retrieved November 16, 2017. ^ Okrent 2003, p. 386. ^ a b Krinsky 1978, p. 96. ^ a b c Krinsky 1978, p. 97. ^ "Air Lines Taking New Office Space; Rickenbacker Signs Rockefeller Lease During Flight" (PDF). The New York Times. June 13, 1940. ISSN 0362-4331. Retrieved November 21, 2017. ^ "New Rockefeller Unit Is 'Topped Out'; Realty Board Foresees Higher Tax Rate" (PDF). The New York Times. April 7, 1939. ISSN 0362-4331. Retrieved November 21, 2017. ^ Krinsky 1978, p. 98. ^ a b c d Adams 1985, p. 231. ^ a b Krinsky 1978, pp. 98–99. ^ "Sixth Avenue Corner Site Is Being Cleared For the Final Unit in Rockefeller Center" (PDF). The New York Times. May 3, 1939. ISSN 0362-4331. Retrieved November 22, 2017. ^ a b "Rockefeller Center is Completed as its Creator Pleads for Peace". The New York Times. November 2, 1939. ISSN 0362-4331. Retrieved November 14, 2017. ^ Okrent 2003, p. 393. ^ "Airline Building Is Dedicated Here; Governors of 17 States Take Part by Pressing Keys" (PDF). The New York Times. October 16, 1940. ISSN 0362-4331. Retrieved November 21, 2017. ^ Okrent 2003, pp. 189–190. ^ Krinsky 1978, p. 11. ^ Okrent 2003, p. 399. ^ a b Okrent 2003, p. 403. ^ Okrent 2003, p. 408. ^ Okrent 2003, p. 410. ^ a b c Okrent 2003, p. 411. ^ Okrent 2003, p. 413. ^ Okrent 2003, p. 412. ^ Krinsky 1978, p. 100. ^ a b "Rockefeller Center Plans New Buildings After War; Rockefeller City Plans Expansion" (PDF). The New York Times. May 4, 1944. ISSN 0362-4331. Retrieved November 22, 2017. ^ a b Krinsky 1978, p. 103. ^ a b c Okrent 2003, p. 417. ^ Okrent 2003, p. 418. ^ Okrent 2003, p. 422. ^ a b c Okrent 2003, p. 424. ^ Krinsky 1978, pp. 102–103. ^ "Rockefellers Buy 6th Ave. Buildings; Acquire 3 Valuable Corners Opposite Their Development, Besides Other Properties Deal Stirs Speculation Seen As Part Of Post-War Expansion Plans – Also Linked To Improvement Of Street" (PDF). The New York Times. August 4, 1943. ISSN 0362-4331. Retrieved November 22, 2017. ^ a b Krinsky 1978, p. 104. ^ a b "Esso Building Is Part Of Rockefeller Center" (PDF). The New York Times. February 5, 1947. ISSN 0362-4331. Retrieved November 23, 2017. ^ a b c "Old Glory 'Tops Out" A New Structure" (PDF). The New York Times. March 13, 1947. ISSN 0362-4331. Retrieved November 23, 2017. ^ a b Okrent 2003, p. 425. ^ a b Okrent 2003, p. 429. ^ Krinsky 1978, pp. 106–107. ^ a b c Krinsky 1978, p. 107. ^ a b c d 600 Fifth Avenue Landmark Designation 1985, p. 2. ^ a b c d Krinsky 1978, p. 108. ^ a b "St. Nicholas Church to Be Razed To Make W ay for Office Building; To Be Erected On Church Site Long Lease Closes St. Nicholas Fight" (PDF). The New York Times. April 1, 1949. ISSN 0362-4331. Retrieved November 22, 2017. ^ "Sinclair Is Moving to Skyscraper On Side of Old St. Nicholas Church; Leaving Rockefeller Center, Oil Concern Leases Eight Floors for 21 Years at a Reported Rental of $16,000,000" (PDF). The New York Times. August 4, 1950. Retrieved November 22, 2017. ^ Krinsky 1978, p. 108–109. ^ Cooper, Lee E. (October 22, 1953). "Center Theatre to Be Torn Down; Office Building Set for Radio City; 19-Story Office Building to Replace Center Theatre RADIO CITY LOSING CENTER THEATRE" (PDF). The New York Times. Retrieved November 15, 2017. ^ a b c "Skyscraper Stands on Stilts Over Wreckers" (PDF). The New York Times. October 9, 1954. Retrieved November 15, 2017. ^ a b "Midtown Block Is Sold; Rockefeller Center Adds '6th' Ave. Land to Holdings" (PDF). The New York Times. August 10, 1953. Retrieved November 27, 2017. ^ Ennis, Thomas W. Jr. (December 14, 1956). "Rockefeller Center To Add Skyscraper; 47-Story Building On 6th Ave. Is Set" (PDF). The New York Times. Retrieved November 16, 2017. ^ "Time-Life Building Gets First Steel" (PDF). The New York Times. April 4, 1958. Retrieved December 4, 2017. ^ a b "Time-Life Building Tops Out at 587-Ft. With a Yule Tree" (PDF). The New York Times. November 25, 1958. Retrieved December 4, 2017. ^ a b Krinsky 1978, p. 114. ^ "Building Is Named For Sperry Rand; Office Structure on 6th Ave. Will Be Called After Principal Lessee" (PDF). The New York Times. March 13, 1961. Retrieved November 27, 2017. ^ "New Hilton Hotel Will Open Today; 46-Story Building Added to Changing Midtown Face Other New Hiltons Opened" (PDF). The New York Times. June 26, 1963. ISSN 0362-4331. Retrieved November 29, 2017. ^ a b c d "Sinclair Building on 5th Ave. Sold; Rockefeller Center Buys Structure for 9 Million" (PDF). The New York Times. May 16, 1963. Retrieved November 22, 2017. ^ a b Krinsky 1978, p. 117. ^ a b "Rockefeller Center To Add Skyscraper; Rockefeller Center to Get Skyscraper" (PDF). The New York Times. August 30, 1967. Retrieved November 23, 2017. ^ "McGraw-Hill Plans a 48-Story Tower; Razing Progresses A Publishing Giant" (PDF). The New York Times. November 28, 1967. ISSN 0362-4331. Retrieved November 29, 2017. ^ Fowler, Glenn (September 16, 1970). "Celanese to Build Skyscraper In Rockefeller Center Complex". The New York Times. ISSN 0362-4331. Retrieved November 29, 2017. ^ a b c d Nash & McGrath 1999, p. 127. ^ a b c Horsley, Carter B. (August 12, 1974). "Rockefeller Center's Expansion Unaffected by Vacant Offices". The New York Times. Retrieved November 23, 2017. ^ a b Horsley, Carter B. (April 8, 1973). "Two Buildings Get A Major Overhaul At Rockefeller Center". The New York Times. Retrieved November 23, 2017. ^ Kaiser, Charles (March 21, 1976). "The Truth Is, Columbia Owns Rockefeller Center Buildings, Too". The New York Times. Retrieved April 6, 2018. ^ a b Oelsner, Lesley (January 7, 1978). "Efforts to Save‐Music Hall Started". The New York Times. Retrieved November 23, 2017. ^ Ferretti, Fred (April 7, 1978). "Agreement Reached on Radio City Tower". The New York Times. Retrieved November 23, 2017. ^ Okrent 2003, p. 430. ^ Shepard, Richard F. (April 19, 1979). "Music Hall to Be Restored". The New York Times. Retrieved December 12, 2017. ^ Grantz, Roberta B.; Cook, Joy (March 14, 1978). "Music Hall: Krupsak blames regime for woes". New York Post. p. 8. ^ McDowell, Edwin (March 29, 1978). "Interior of Music Hall Designated As Landmark Despite Objections". The New York Times. Retrieved November 23, 2017. ^ "Radio City In National Register". The New York Times. May 13, 1978. ISSN 0362-4331. Retrieved November 23, 2017. ^ Clines, Francis X. (March 1, 1978). "About New York". The New York Times. Retrieved November 23, 2017. ^ "Agreement With U.D.C. Keeps Music Hall Open Indefinitely". The New York Times. April 13, 1978. Retrieved November 23, 2017. ^ a b Prial, Frank J. (June 17, 1982). "22 Acres Of Real Estate That Generate Millions". The New York Times. Retrieved November 23, 2017. ^ Glancy 1992, p. 426. ^ Adams 1985, pp. 270–271. ^ Adams 1985, p. 269. ^ "Rockefeller Center – Accompanying photos, c.1933 to c.1986". National Park Service. January 23, 1987. Retrieved March 6, 2014. ^ Pitts 1987, p. 3. ^ Okrent 2003, p. 428. ^ a b Dowd, Maureen (February 6, 1985). "Columbia Is To Get $400 Million In Rockefeller Center Land Sale". The New York Times. Retrieved December 11, 2017. ^ Okrent 2003, p. 431. ^ Giovannini, Joseph (August 7, 1987). "Rainbow Room: Re-creating the Glamour". New York Times. Retrieved November 3, 2012. ^ Goldberger, Paul (December 20, 1987). "Architecture View; The New Rainbow Room: S'Wonderful!". The New York Times. ISSN 0362-4331. Retrieved December 9, 2017. ^ Dunlap, David W. (June 18, 1986). "A Quiet Place at Rca's Summit Drifts Onto the Pages of the Past". The New York Times. ISSN 0362-4331. Retrieved December 7, 2017. ^ a b Hevesi, Dennis (July 14, 1988). "30 Rock? RCA? NBC? No, G.E.!". The New York Times. Retrieved November 14, 2017. ^ Cole, Robert J. (October 31, 1989). "Japanese Buy New York Cachet With Deal for Rockefeller Center". The New York Times. Retrieved November 15, 2017. ^ Deutsch, Claudia H. (May 4, 1996). "NBC Will Buy Rockefeller Center Space". The New York Times. Retrieved November 15, 2017. ^ a b Bagli, Charles V. (December 22, 2000). "Era Closes at Rockefeller Center With $1.85 Billion Deal on Sale". The New York Times. Retrieved November 15, 2017. ^ Dunlap, David W. (October 19, 1999). "Rockefeller Center Quietly Closes Theater". The New York Times. Retrieved November 22, 2017. ^ a b c Collins, Glenn (February 21, 1999). "Bringing Up the Basement; Rockefeller Center Is Turning Its Underground Concourse Into a Shiny New Shopping Zone. Lost in the Bargain, Preservationists Say, Is an Art Deco Treasure". The New York Times. Retrieved December 13, 2017. ^ Dominus, Susan (June 20, 2009). "Big City – Rockefeller Center Club Follows Rainbow Room in Closing". The New York Times. Retrieved February 19, 2018. ^ Marx, Rebecca (July 11, 2011). "Somebody Is Finally Paying Attention to the Rainbow Room – New York Restaurants and Dining – Fork in the Road". Blogs.villagevoice.com. Archived from the original on July 6, 2012. Retrieved May 11, 2012. ^ "Rainbow Room reopens at top of 30 Rockefeller Plaza after five years". New York. Associated Press. October 5, 2014. Retrieved December 10, 2017. ^ "30 Rock officially renamed Comcast Building". am New York. July 1, 2015. Retrieved December 11, 2017. ^ "30 Rock Officially Renamed Comcast Building; NBC Peacock Lights Up NYC Skyline for First Time in History". NBCUniversal Media LLC. July 1, 2015. Retrieved April 14, 2016. ^ Stewart, J. (2016). Gotham Rising: New York in the 1930s. I. B. Tauris, Limited. p. xviii. ISBN 978-1-78453-529-2. Retrieved November 23, 2017. ^ a b Krinsky 1978, p. 4. ^ Adams 1985, pp. 29–30. ^ a b Federal Writers' Project 1939, p. 332. ^ Balfour 1978, pp. 20–21. ^ a b Adams 1985, p. 237. ^ "Now it's Uniroyal" (PDF). The New York Times. February 28, 1967. Retrieved November 22, 2017. ^ Sterne, Michael (July 8, 1976). "Simon & Schuster Takes New Lease on New York". The New York Times. Retrieved November 22, 2017. ^ "Old Roxy Keeps Right To Its Name; Circuit Court In 2-To-1 Decision Orders Radio City Theatre To Drop Word. New Appeal Is Planned Rko Permitted To Advertise Its Employment Of Rothafel, But Without Causing Confusion" (PDF). The New York Times. May 16, 1933. Retrieved November 22, 2017. ^ a b Adams 1985, p. 46. ^ a b Federal Writers' Project 1939, p. 339. ^ Adams 1985, p. 51. ^ "Two Skyscrapers Will Open This Week; RCA and John Street Buildings Ready" (PDF). The New York Times. April 30, 1933. ISSN 0362-4331. Retrieved November 11, 2017. ^ "Bid Farewell to 30 Rock's GE Sign; 'Comcast' Will Top the Tower". Curbed. June 18, 2014. ^ a b Adams 1985, p. 59. ^ Krinsky 1978, p. 53. ^ "Contact Us". NBCUniversal. Retrieved November 16, 2017. ^ a b Adams 1985, p. 61. ^ Krinsky 1978, p. 138. ^ Karp & Gill 1982, p. 62. ^ a b c Adams 1985, p. 40. ^ "Facade 'Topped Out' In Rockefeller Unit; Last Stone Laid On Exterior Of Music Hall – Work On Other Buildings Speeded" (PDF). The New York Times. August 11, 1932. Retrieved November 14, 2017. ^ Sanfilippo, Mike (November 14, 2017). "Radio City Music Hall". New York Magazine. Retrieved November 15, 2017. ^ Adams 1985, pp. 53–54. ^ Federal Writers' Project 1939, p. 337. ^ a b c Adams 1985, p. 35. ^ Krinsky 1978, p. 35. ^ Allan Jewell, Edward (December 24, 1933). "At Rockefeller Center; A Survey of the Recent Installations – Murals and Architectural Sculpture" (PDF). The New York Times. Retrieved November 14, 2017. ^ Adams 1985, p. 36. ^ Roussel 2006, p. 9. ^ Roussel 2006, p. 10. ^ Adams 1985, p. 37. ^ a b c Balfour 1978, p. 42. ^ Adams 1985, p. 88. ^ a b Federal Writers' Project 1939, pp. 334–335. ^ Adams 1985, p. 107. ^ a b Adams 1985, p. 96. ^ International Building Landmark Designation 1985, p. 9. ^ a b Adams 1985, p. 137. ^ International Building Landmark Designation 1985, pp. 8–9. ^ a b Krinsky 1978, p. 151. ^ "New Units Rushed in Fifth Av. Center; Rockefeller International and Italian Buildings to Be Ready by May 1. Frontage Now Complete; Promenade to Link Lobbies of Twin Structures in Novel Shopping Arcade" (PDF). The New York Times. March 4, 1935. Retrieved November 20, 2017. ^ Balfour 1978, p. 54. ^ a b c Krinsky 1978, p. 93. ^ "Radio City Lease Takes in 6 Floors; General Dynamics Is Lessee and Gives Name to Old Time-Life Building" (PDF). The New York Times. January 12, 1960. Retrieved November 21, 2017. ^ Shipler, David K. (February 11, 1971). "General Dynamics Moving Headquarters Out of City". The New York Times. Retrieved November 21, 2017. ^ 600 Fifth Avenue Landmark Designation 1985, p. 1. ^ Okrent 2003, p. 426. ^ 600 Fifth Avenue Landmark Designation 1985, p. 4. ^ a b 600 Fifth Avenue Landmark Designation 1985, p. 3. ^ Cooper, Lee E. (January 11, 1951). "Large Space in Fifth Ave. Area Leased For Development of Swiss Trade Center" (PDF). The New York Times. Retrieved November 22, 2017. ^ Adams 1985, p. 225. ^ Balfour 1978, p. 55. "Visit the TODAY plaza: What you need to know". NBC News. September 12, 2014. Retrieved November 21, 2017. "About TODAY". msn.com. Today. Retrieved March 6, 2014. ^ Sarrazin, Marc-André (April 21, 2005). "Nintendo World Store Opening Party — Nintendo Spin". NintendoSpin.com. Archived from the original on July 14, 2011. Retrieved August 10, 2009. ^ "75 Rockefeller Plaza – Time Warner Lease – Mohamed Al-Fayed". The Real Deal New York. January 25, 2012. ^ David M Levitt (January 15, 2013). "RXR Said to Buy 99-Year Leasehold at 75 Rockefeller Plaza". Bloomberg.com. ^ a b Schumach, Murray (August 6, 1971). "Touches of Sidewalk Splendor Planned for Midtown". The New York Times. Retrieved November 23, 2017. ^ "Ownership". 1211 Avenue of the Americas. Archived from the original on October 10, 2014. Retrieved March 6, 2014. ^ a b "Portfolio". Rockefeller Group. February 6, 2012. Retrieved December 4, 2017. ^ Scardino, Albert (December 11, 1988). "Mitusi Unit Gets Exxon Building". The New York Times. Retrieved March 6, 2014. ^ Pearson, Anne and Ralph Bivins. "Exxon moving corporate headquarters to Dallas". Houston Chronicle. October 27, 1989. p. A1. Retrieved on July 29, 2009. ^ a b c Krinsky 1978, p. 64. ^ a b "Rockefeller City to Have Big Plaza" (PDF). The New York Times. June 10, 1932. ISSN 0362-4331. Retrieved November 11, 2017. ^ a b c Adams 1985, p. 167. ^ a b c Balfour 1978, p. 40. ^ a b c Weisman 1959, p. 56. ^ Krinsky 1978, pp. 62–63. ^ a b Weisman 1959, p. 57. ^ a b Adams 1985, p. 159. ^ Roussel 2006, p. 97. ^ Roussel 2006, p. 99. ^ Roussel 2006, p. 102. ^ Adams 1985, pp. 160–161. ^ Federal Writers' Project 1939, p. 336. ^ Roussel 2006, pp. 101, 105. ^ a b c Adams 1985, p. 168. ^ a b "The History of the Rockefeller Center Christmas Tree, a NYC Tradition". www.6sqft.com. November 29, 2016. ^ Okrent 2003, p. 360. ^ Ma, Laura; Kwok, Jason. "What are the world's best ice skating rinks?". CNN. Retrieved December 19, 2016. ^ Adams 1985, p. 169. For a reference to the roller skating rink's opening, see: "Trees and Birds Stir in 6th Ave" (PDF). The New York Times. April 18, 1940. Retrieved November 25, 2017. ^ a b c Adams 1985, p. 169. ^ Adams 1985, pp. 169–170. ^ a b Okrent 2003, p. 416. ^ a b "Vista for Easter" (PDF). The New York Times. April 4, 1942. Retrieved December 12, 2017. ^ a b "Rockefeller Center, New York City". VirtualTourist. March 13, 2008. Retrieved March 6, 2014. ^ a b c Adams 1985, p. 170. ^ Kilgannon, Corey (January 17, 2012). "Questions Fly Over a Flag Flown Upside Down". City Room. Retrieved February 19, 2018. ^ "John D. Rockefeller Jr.'s Creed Is Unveiled in a Memorial Here; Ten Beliefs Inscribed on a Marble Slab Dedicated in Rockefeller Plaza by Governor and Two Brothers" (PDF). The New York Times. July 17, 1962. ISSN 0362-4331. Retrieved November 30, 2017. ^ a b c Balfour 1978, p. 223. ^ Krinsky 1978, p. 7. ^ a b c d e f Adams 1985, p. 177. ^ Krinsky 1978, pp. 32–33. ^ "New Avenue From 42nd to 59th St. Urged To Cut Through Radio City on Three Levels" (PDF). The New York Times. May 8, 1931. ISSN 0362-4331. Retrieved November 11, 2017. ^ Adams 1985, p. 178. ^ a b c "The Robot City Nobody Sees" (PDF). The New York Times Magazine. The New York Times. June 18, 1944. Retrieved November 27, 2017. ^ Adams 1985, pp. 178–179. ^ Dunlap, David W. (October 28, 2011). "Lever House Closes Once a Year to Maintain Its Ownership Rights". The New York Times. ISSN 0362-4331. Retrieved February 20, 2018. There is another significant hybrid: purely private space to which the public is customarily welcome, at the owners’ implicit discretion. These spaces include Lever House, Rockefeller Plaza and College Walk at Columbia University, which close for part of one day every year. ^ a b "Gardens of the World Atop Radio City; New York Watches the Growth of a New Venture in the Realm of Horticulture" (PDF). The New York Times. September 2, 1934. Retrieved November 20, 2017. ^ a b "New York's "Hanging Gardens"" (PDF). Albany Times-Union. 1934. Retrieved November 20, 2017. ^ Okrent 2003, p. 183. ^ a b Weisman 1959, p. 58. ^ Adams 1985, p. 185. ^ Balfour 1978, p. 51. ^ Krinsky 1978, p. 62. ^ a b c d e Balfour 1978, p. 52. ^ Weisman 1959, p. 59. ^ "3 New Rooftop Gardens; Rockefeller Center Unit Will Open Terrace Displays" (PDF). The New York Times. September 28, 1939. Retrieved November 28, 2017. ^ a b c "Babylon Outdone by RCA's Gardens". New York Post. April 16, 1935. p. 7. Retrieved November 20, 2017 – via Fultonhistory.com. ^ a b Adams 1985, p. 186. ^ a b "2 Radio City Theatres To Build Roof Gardens" (PDF). The New York Times. January 30, 1937. Retrieved November 15, 2017. ^ Okrent 2003, p. 356. ^ Balfour 1978, pp. 125–137. ^ Krinsky 1978, p. 91. ^ Okrent 2003, p. 355. ^ Adams 1985, p. 188. ^ "PROSPECTS; Roof-Garden Restorations". The New York Times. June 29, 1986. ISSN 0362-4331. Retrieved November 23, 2017. ^ "Underground Traffic Planned" (PDF). New York Sun. October 6, 1933. p. 20. Retrieved November 10, 2017 – via Fultonhistory.com. ^ "Radio City to Build Tunnels for Public" (PDF). The New York Times. December 4, 1931. Retrieved November 15, 2017. ^ Okrent 2003, p. 432. ^ Adams 1985, p. 209. ^ "Rockefeller City Gets a Huge Ramp; It Will Take Trucks 34 Feet Underground to Help Solve Traffic Problem. To Serve 3-Block Area; All Deliveries Will Be Made Below the Surface and Transferred to Elevators" (PDF). The New York Times. May 22, 1934. ISSN 0362-4331. Retrieved November 11, 2017. ^ a b "The Concourse at Rockefeller Center: Directory" (PDF). Rockefeller Center. January 14, 2018. Retrieved February 20, 2018. ^ Alpern & Durst 1996, p. 38. ^ Okrent 2003, p. 97. ^ "Church Won't Sell Site to Rockefeller" (PDF). The New York Times. 1929. ISSN 0362-4331. Retrieved November 22, 2017. ^ a b c Krinsky 1978, p. 110. ^ a b Adams 1985, p. 21. ^ a b c d "Outline is Drawn of Radio City Art" (PDF). The New York Times. December 6, 1931. ISSN 0362-4331. Retrieved November 11, 2017. ^ "Babylonian Gardens To Blossom 60 Stories Above Street In 'Radio City'" (PDF). Yonkers Statesman. August 20, 1931. p. 11. Retrieved November 11, 2017 – via Fultonhistory.com. ^ a b Balfour 1978, p. 137. ^ a b Nash & McGrath 1999, p. 93. ^ Adams 1985, p. 260. ^ Roussel 2006, p. 6. ^ Adams 1985, pp. 211–212. ^ Roussel 2006, p. 141. ^ Adams 1985, pp. 252–267. ^ a b Roussel 2006, "Artists' Biographies and Locations of Art", pp. 144–157. ^ a b Smith 2014, pp. 91–92. ^ a b c Okrent 2003, p. 302. ^ a b "Rivera RCA Mural Is Cut From Wall; Rockefeller Center Destroys Lenin Painting At Night And Replasters Space. Vandalism,' Says Artist Sloan, Urging Boycott, Says He Will Never Exhibit There – Protest Meetings Called" (PDF). The New York Times. February 13, 1934. ISSN 0362-4331. Retrieved November 11, 2017. ^ Adams 1985, p. 139. ^ a b Roussel 2006, p. 105. ^ Roussel 2006, p. 101. ^ Teltsch, Kathleen (April 8, 1984). "2 WORKS TO REJOIN PROMETHEUS AFTER 50 YEARS". The New York Times. Retrieved December 11, 2017. ^ Thomas, Robert Mcg. Jr. (February 27, 1998). "Leonardo Nole, 91, Prometheus Statue's Model". The New York Times. Retrieved January 11, 2019. ^ Smith 2014, p. 92. ^ a b Smith 2014, p. 97. ^ Okrent 2003, p. 304. ^ Okrent 2003, p. 312. ^ Okrent 2003, p. 313. ^ Smith 2014, p. 98. ^ "Destroyed By Rockefellers, Mural Trespassed On Political Vision". NPR. March 9, 2014. Retrieved November 30, 2017. ^ Okrent 2003, p. 319. ^ Roussel 2006, pp. 94–107. ^ a b Balfour 1978, p. 215. ^ Balfour 1978, pp. 213–214. ^ Okrent 2003, p. 182. ^ Le Corbusier 1947, p. 62. ^ Balfour 1978, p. 216. ^ Le Corbusier 1947, p. 54. ^ a b Balfour 1978, p. 217. ^ Le Corbusier 1947, p. 58. ^ a b Allen, Frederick Lewis (October 1938). "Look at Rockefeller Center". Harper's. pp. 506–513. Retrieved December 7, 2017. ^ Balfour 1978, p. 218. ^ Giedion, Sigfried (1941). Space, Time and Architecture: The Growth of a New Tradition. Harvard University Press. pp. 845–853. ISBN 978-0-67483-040-0. Retrieved December 7, 2017. ^ Balfour 1978, p. 220. ^ a b Balfour 1978, p. 221. ^ Okrent 2003, p. 190. ^ Balfour 1978, p. 222. ^ Mumford, Lewis (1956). From the ground up: observations on contemporary architecture, housing, highway building, and civic design. Harvest book. Harcourt, Brace. p. 25. Retrieved December 7, 2017. ^ Balfour 1978, p. 224. ^ Scully, Vincent (1969). American Architecture and Urbanism. Trinity University Press. p. 154. ISBN 978-1-59534-180-8. Retrieved December 7, 2017. ^ Fitch & Waite 1974, p. 1. ^ Goldberger, Paul (July 14, 1976). "Rockefeller Center Design: A Triumph for 30's and 70's". The New York Times. Retrieved February 19, 2018. Adams, Janet (1985). "Rockefeller Center Designation Report" (PDF). City of New York; New York City Landmarks Preservation Commission. Alpern, Andrew; Durst, Seymour B. (1996). New York's Architectural Holdouts. Dover Publications. ISBN 978-0-48629-425-4. Balfour, Alan (1978). Rockefeller Center: Architecture as Theater. McGraw-Hill, Inc. ISBN 978-0-07003-480-8. "Designation List 114 LP-0995; Radio City Music Hall" (PDF). New York City Landmarks Preservation Commission. March 28, 1978. Retrieved November 15, 2017. "Designation List 179 LP-1447; Manufacturers Hanover Trust Company Building (formerly 600 Fifth Avenue Building)" (PDF). New York City Landmarks Preservation Commission. April 23, 1985. Retrieved November 15, 2017. "Designation List 179 LP-1449; International Building" (PDF). New York City Landmarks Preservation Commission. April 23, 1985. Retrieved November 15, 2017. Federal Writers' Project (1939). New York City: Vol 1, New York City Guide. US History Publishers. ISBN 978-1-60354-055-1. Fitch, James Marston; Waite, Diana S. (1974). Grand Central Terminal and Rockefeller Center: A Historic-critical Estimate of Their Significance. Albany, New York: The Division. Glancy, Dorothy J. (January 1, 1992). "Preserving Rockefeller Center". 24 Urb. Law. 423. Santa Clara University School of Law. Retrieved March 6, 2014. Karp, Walter; Gill, Brendan (1982). The Center: A History and Guide to Rockefeller Center. American Heritage Publishing Company, Inc. ISBN 978-0-44224-748-5. Kayden, Jerold S.; The Municipal Art Society of New York (2000). Privately Owned Public Space: The New York City Experience. Wiley. ISBN 978-0-47136-257-9. Kert, Bernice (October 12, 1993). Abby Aldrich Rockefeller: The Woman in the Family. New York: Random House. ISBN 978-0-39456-975-8. Retrieved March 6, 2014. Krinsky, Carol H. (1978). Rockefeller Center. Oxford University Press. ISBN 978-0-19502-404-3. Le Corbusier (1947). When the Cathedrals Were White: A Journey to the Country of Timid People. Translated by Hyslop, F.E. Routledge. Nash, Eric; McGrath, Norman (1999). Manhattan Skyscrapers. Princeton Architectural Press. ISBN 978-1-568-98181-9. Okrent, Daniel (2003). Great Fortune: The Epic of Rockefeller Center. London: Penguin Book. ISBN 978-0-142-00177-6. Pitts, Carolyn (January 23, 1987). "National Register of Historic Places Inventory-Nomination". National Park Service. Retrieved March 6, 2014. Reich, Cary (October 1, 1996). The Life of Nelson A. Rockefeller: Worlds to Conquer, 1908–1958. New York: Doubleday. Retrieved March 6, 2014. Rockefeller, David (October 15, 2002). Memoirs. New York: Random House. Retrieved March 6, 2014. (Subscription required (help)). Roussel, Christine (May 17, 2006). The Art of Rockefeller Center. New York: W.W. Norton & Company. ISBN 978-0-39306-082-9. Seielstad, B.G. (September 1930). "Radio City to Cost $250,000,000". Popular Science Monthly. Retrieved March 6, 2014. Smith, Richard Norton (2014). On His Own Terms: A Life of Nelson Rockefeller. Random House. ISBN 978-0-37550-580-5. Srodes, James (June 25, 1999). Allen Dulles: Master of Spies. Washington: Regnery Publishing, Inc. Retrieved March 6, 2014. Weisman, Winston R. (1959). "The First Landscaped Skyscraper". Journal of the Society of Architectural Historians. 18 (2): 54–59. doi:10.2307/987977. JSTOR 987977. "World's Largest Theater in Rockefeller Center Will Seat Six Thousand Persons". Popular Mechanics. August 1932. Retrieved March 6, 2014. Loth, David G. (1966). The city within a city: the romance of Rockefeller Center. W. Morrow. ISBN 978-1-19985-910-5. Rockefeller, John D., Jr.; Rockefeller, Nelson A.; Butler, Nicholas Murray; Sarnoff, David; Murray, Thomas A.; LaGuardia, Fiorello H. (1940). The Last Rivet: The story of Rockefeller Center, a city within a city, as told at the ceremony in which John D. Rockefeller, Jr., drove the last rivet of the last building, November 1, 1939. New York: Columbia University Press. ISBN 978-1-25815-535-3. A more extensive list of sources can be found in Adams 1985, pp. 273–274; Balfour 1978, p. 243; Krinsky 1978, pp. 213–214; and Okrent 2003, pp. 473–480.